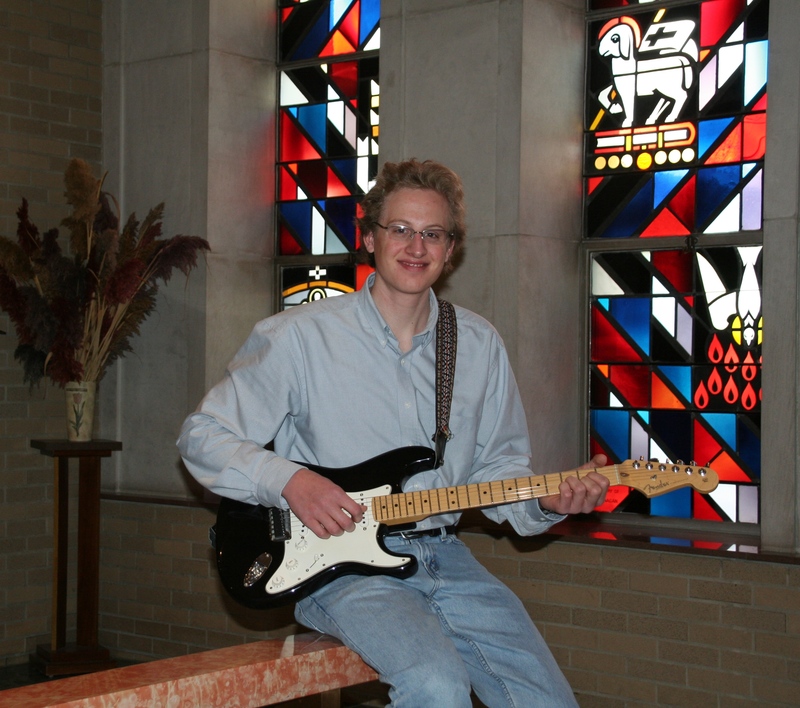 Doug Resch, a Music and English major at Silver Lake College will present his senior recital on classical and electric guitar on Friday, December 4 at 7:30 pm. This recital, which is free and open to the public, will take place in the College Chapel located on the Silver Lake College Campus, 2406 South Alverno Road. Doug’s program includes “Lagrima” by Francisco Tarrega and “Allegro op. 15, no. 13” by Mauro Giuliani on classical guitar and “Caprice #24” by Niccolo Paganini and “Always With Me, Always With You” by Joe Satriani on electric guitar. SLC Instrumental professor Kelly Meyer, along with Barry Buechner, SLC ’08, will accompany Doug for the electric guitar portion of the concert. During his time at Silver Lake, Doug has been an active member of the Concert Choir, Chorale, Wind Ensemble and Jazz Band. He is a member of the Music Educators National Conference Student Chapter and Mattermind, an SLC English club. Doug is native of Branch, Wisconsin and was homeschooled through high school. He started playing guitar during high school with lessons at the Holy Family Conservatory and then continuing with Professor Meyer. Doug teaches guitar lessons at Mad About Music in Manitowoc and also works part-time on his parents farm. Silver Lake College will kick off the holiday season by holding its second annual “Christmas at Silver Lake” celebration featuring two separate music concerts. “Come Thou Long Expected Jesus”, a collaborative effort between the Silver Lake College Choral Organizations, Handbell Ensemble and Campus Ministries Program, will be held on Saturday, December 5th at 7:30 pm and a “Christmas Instrumental Concert” featuring the Wind Ensemble and Jazz Ensemble will be held on Sunday, December 6th at 3:00 pm. Both events are free and open to the public and will be held in the Silver Lake College Chapel located at 2406 South Alverno Road in Manitowoc. Canned Goods to benefit Peter’s Pantry will be taken at the door. The “Come Thou Long Expected Jesus” concert will present a variety of Choral and Handbell Repertoire that includes Christmas Anthems, Audience Carols, and Seasonal Readings. The “Christmas Instrumental Concert” will present such pieces as Christmastime Around the World by Robert W. Smith, Shepherds’ Farewell by Hector Berlioz, and Irving Berlin Christmas arranged by Warren Barker. 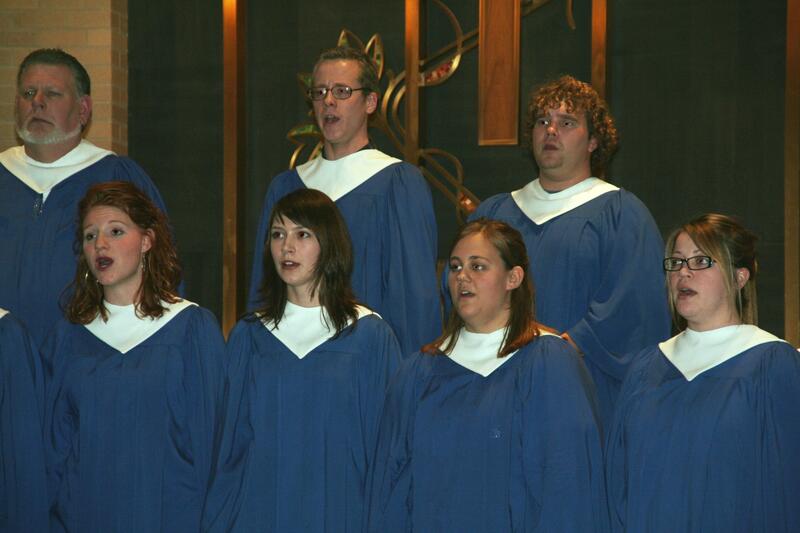 The Silver Lake College Choral Organizations are under the direction of Damon Carlson and Dr. Perry D. White, the Handbell Ensemble is lead by Sandra Eithun and the Campus Ministries Program is lead by Deacon Paul Gleichner. The Wind Ensemble and Jazz Ensemble are under the direction of Kelly Meyer. On Sunday, November 22nd, Silver Lake College with host a Cello-Piano Concert featuring the talents of Hungarian Guest Cellist, Arpad Muranyi and Silver Lake College Piano Professor Melissa Martiros. The concert, which is free and open to the public, will take place at 3:00 pm in the Silver Lake College Chapel, located at 2406 South Alverno Road in Manitowoc. 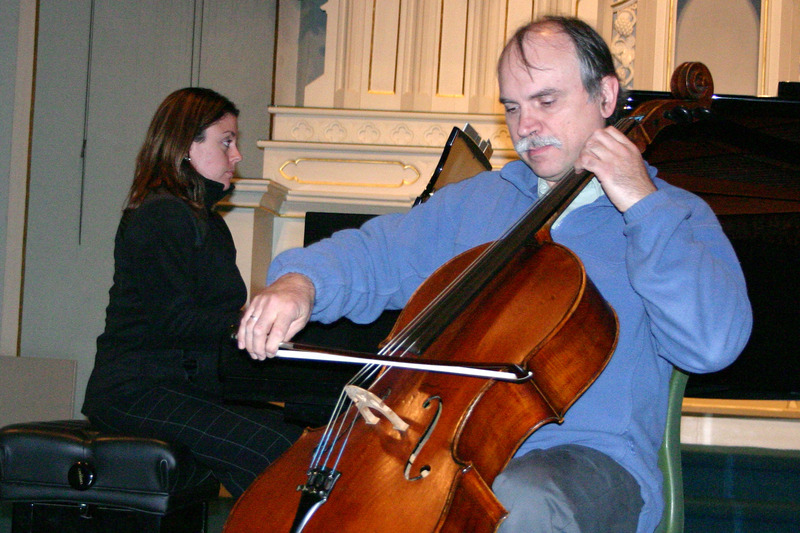 Sunday’s program will feature several classic and contemporary masterworks for cello and piano, beginning with the 4-movement Sonata #2 in D Major (BWV 1028) by J.S. Bach, followed by the 4-movement Sonata #4 in C Major, op. 102, No. 1 by Beethoven, and Sonata in D Minor for Cello and Piano by Dmitri Shostakovich. The program will conclude with The First Rhapsody by 20th century Hungarian composer Bela Bartok. Cellist Arpad Muranyi received his Performance Artist and Pedagogy degree in cello performance from the Franz Liszt Academy of Music, Budapest, Hungary in 1981 and his Master of Music degree in cello performance from Florida State University, Tallahassee. After completing his coursework for his doctoral degree at Boston University, he joined the Sacramento Symphony Orchestra in 1989. While working in the orchestra, Arpad returned to school and graduated with a Bachelor of Science in Electronic Engineering. From 1991 to 2007 Arpad worked as a signal integrity engineer at Intel Corporation and currently is a principal engineer for Mentor Graphics Corporation. Melissa Martiros is currently working on her doctoral dissertation at the University of Wisconsin, Madison where she has completed course work for degrees in Piano Performance and Pedagogy as well as Special Education. She holds degrees in piano performance from Bowling Green State University and Westfield State College. Her primary area of research involves teaching piano to children with disabilities. Melissa is currently the Professor of Piano and Piano Pedagogy at Silver Lake College and a Music Lecturer at the UW-Fond du Lac. Previous positions include Bluffton University in Bluffton, OH, and the Arboretum Music School in Waunakee, WI. The second concert performance in the Silver Lake College Guest Music Artist Series for 2009-2010 will feature the Brass Roots Trio on Sunday, November 15th at 3:00 PM in the Silver Lake College Chapel, located at 2406 South Alverno Road in Manitowoc. Brass Roots Trio, consisting of pianist Rosetta Senkus Bacon, trumpeter Travis Heath, and French horn player Douglas Lundeen, delivers a captivating performance full of passion, imagination and charisma by featuring virtuosic showpieces, decadent tangos and Symphonic sounds that melt into sultry jazz. The Concert, titled “Con Brio!”, will include highlights by Caccini, Manfredini, and Mozart, from the Baroque and Classical styles, 20th century classics by Copland, Gershwin, Martin and Brubeck, energizing Spanish flavors from Argentina and Brazil by Piazzolla and Villa Lobos, and soulful spirituals, “I’ll Fly Away” by M. Hayes, “Ride on, King Jesus” by H. Johnson, and “This Little Light of Mine” by M. Thomas. Members of the trio have demonstrated their talents across the country and around the world with engagements at Carnegie Hall in New York, the Kennedy Center in Washington, D.C., Cultural Centers in Taiwan, Japan, Switzerland, Spain, Germany, and Lithuania, as well as with major symphony orchestras in the US, England and Latin America. This year marks the 35th annual Silver Lake College Pancake Breakfast. The breakfast began in 1975 under the direction of Sister Imelda Ann Dickrell, Silver Lake College Dietician at the time, at the request of three students, Kevin Kumbalek, John Kaufman and Steve Krupski who wanted to do a fundraiser. Under Sister Imelda’s direction, she contacted vendors who donated all of the ingredients for the breakfast and organized students, faculty, and administration who worked together frying pancakes in the college kitchen and serving it to the patrons in the college cafeteria. This year’s breakfast will be held on Sunday, November 15, from 8:00 AM to 12:00 noon at the Manitowoc college campus. The menu will include pancakes, sausage, apple sauce, coffee, juice and milk. Tickets are $5.50 in advance and $5.95 at the door; children five and under are free. A bake sale featuring homemade kolaches, bread, cookies and other baked goods will be held in the Cafeteria. Visitors are welcome to attend Mass in the College Chapel at 10:00 AM. Pancakes will be prepared by the Pancake Brothers. For advance tickets, please call 920-686-6188. You are currently browsing the Silver Lake College News blog archives for November, 2009.